This has been an excellent year for some Middle East bourses, particularly those in Kuwait, Qatar and the United Arab Emirates. Investing in those markets is still a new concept to many investors in the U.S. and when they do opt to play the Middle East, they do so with a diversified fund such as the iShares MSCI Frontier 100 ETF (FM) . That also means Qatar and UAE will represent just a sliver of that index’s weight. Investors looking to stay involved with those countries have other ETF options, including the Market Vectors Gulf States Index ETF (MES). Most importantly, noted technical analyst Ralph Acampora pointed out on Twitter Monday that MES has staged a significant technical breakout and the ETF is now trading at levels not seen in over five years. MES Is up 2.6% Monday on volume of 7,700 shares, which does not sound like much, but consider the ETF’s trailing 90-day average is about 6,660 shares. 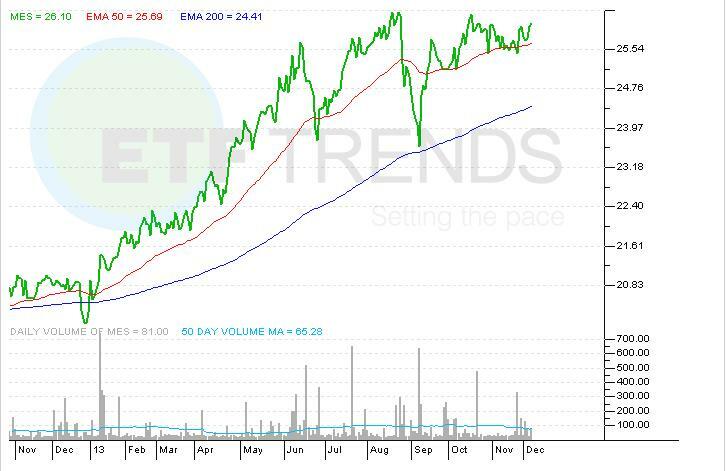 The ETF trades around $26.80 at this writing, but Acampora sees upside to $32.